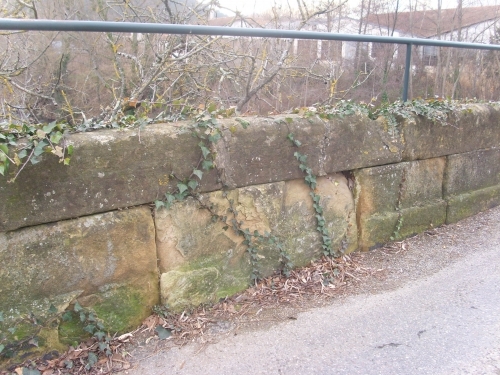 Couiza is linked to Montazels. 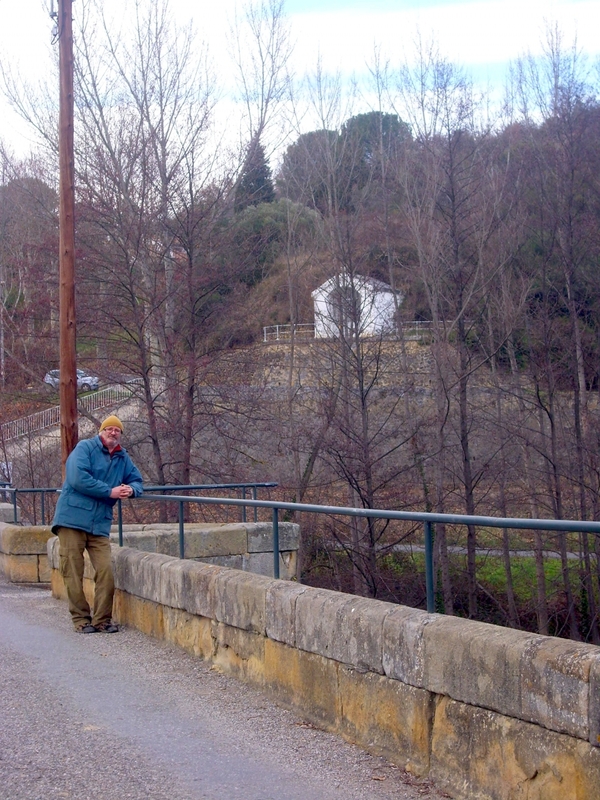 It is a mile by road, but you can walk there from the centre of Couiza old village, on the southern side of the Sals. You come to a bridge over the River Aude, just wide enough for a small car to travel across. The formal history books say they cannot date this bridge exactly, but it was built “sometime before 1618.” I suspect it too was built when the castle was reconstructed in 1581 for Anne de Joyeuse’s marriage. 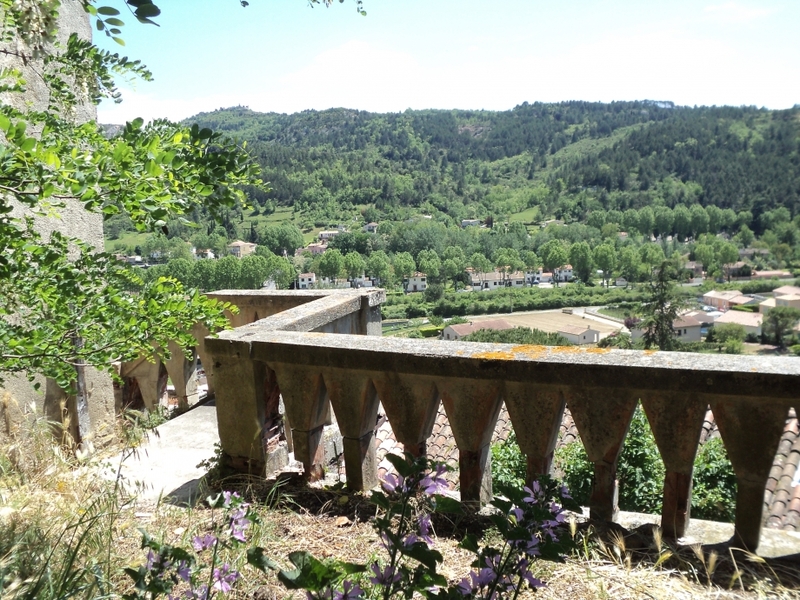 From the bridge, if the trees are not too heavy with leaves, you can see the junction of the River Sals with the River Aude, above which you are standing. Montazels, which is quite famous in the region as the village where our priest-who-found-a-fortune, Bérenger Saunière, was born and brought up. 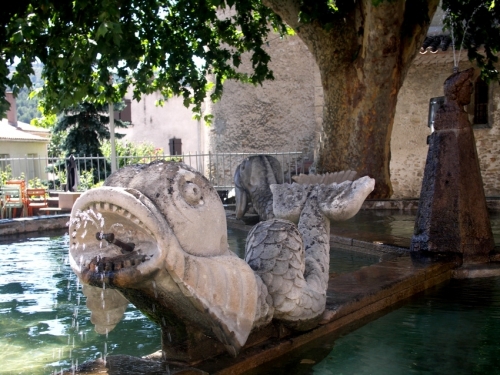 The family home, long since become a holiday home, is opposite the pool in the centre of the main square. It's the tallest house on the square. I loved the strange creatures in the pool. 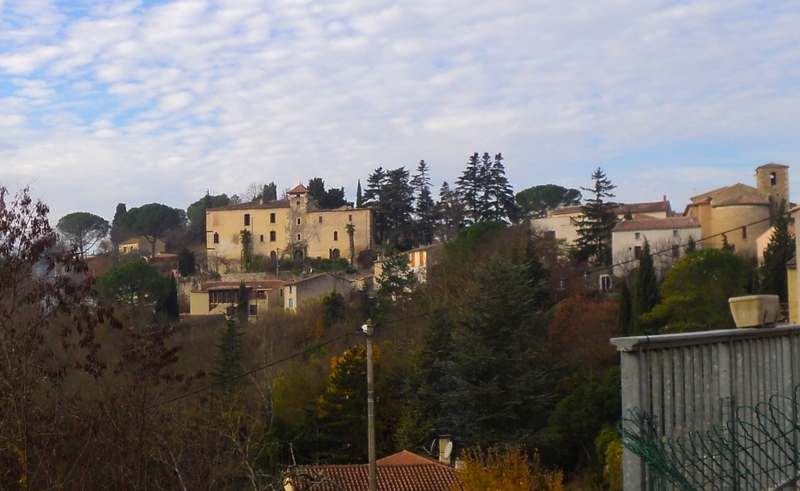 From this square you can see Rennes-le-Château on the hill on the far side of Couiza, (Bérenger Saunière would have seen it everyday of his life) while on the right is Montazels church. The lady who lives opposite the church door has the key. Although the famous priest would have worshipped there, few Rennes-le-Château researchers have ever visited it. 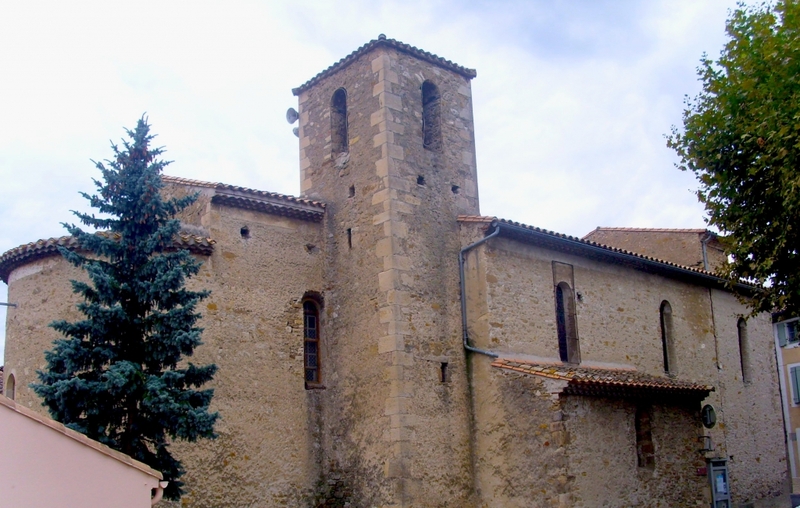 At one time the village was known as Sainte Cécile and the first mention of the church in a document was in 1004, so it's quite possible it was first built during Visigothic or Carolingian times. 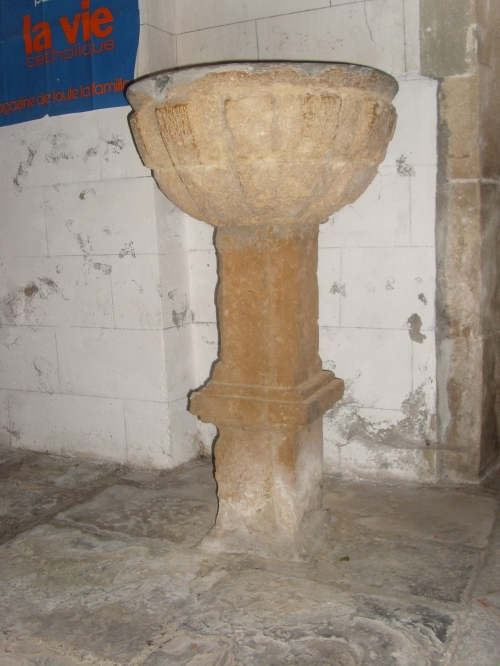 I believe the font to be Visigothic - compare it to the vase found at Rennes-les-Bains. 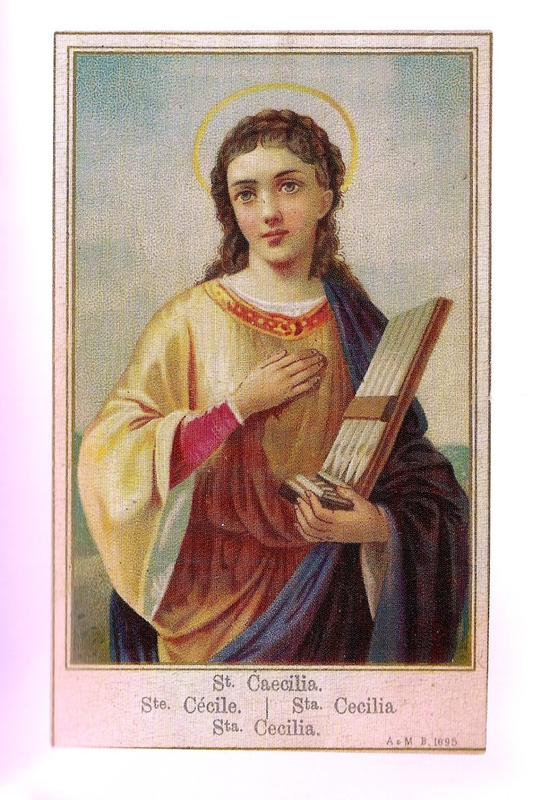 Sainte Cecilia is the patron saint of music, (picture from Google), a young Roman who played the lute. The strangest thing of all was the Virgin. 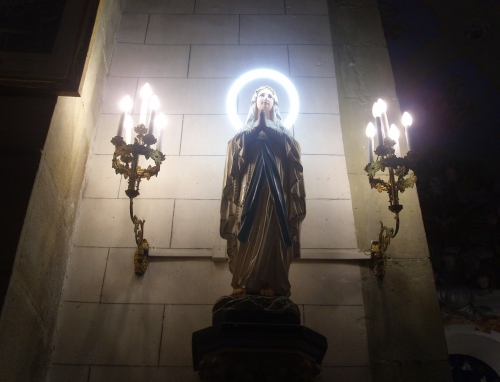 The lady who held the key switched on the lights of the church and there was the Virgin, just inside the door, all lit up! A church was first built in this spot in 1004 and a chateau a little further up the hill was built at the same time. At first the château was little more than a place of refuge for the villagers, eventually it became a defensive castle and then a stately home around the time it was sold privately after the Revolution. 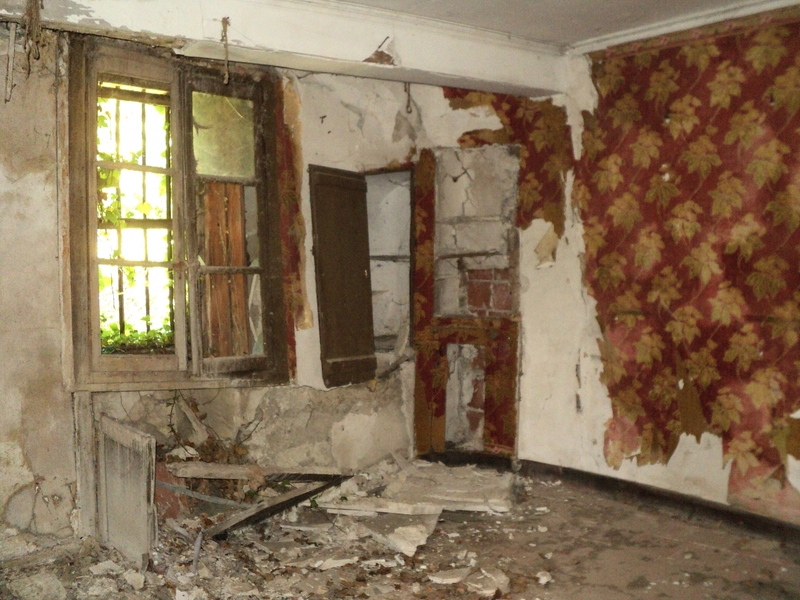 Different parts of it have been renovated at different times and it seems to have been abandoned around 1950; the living rooms are full of "fin-de-siècle" splendour. 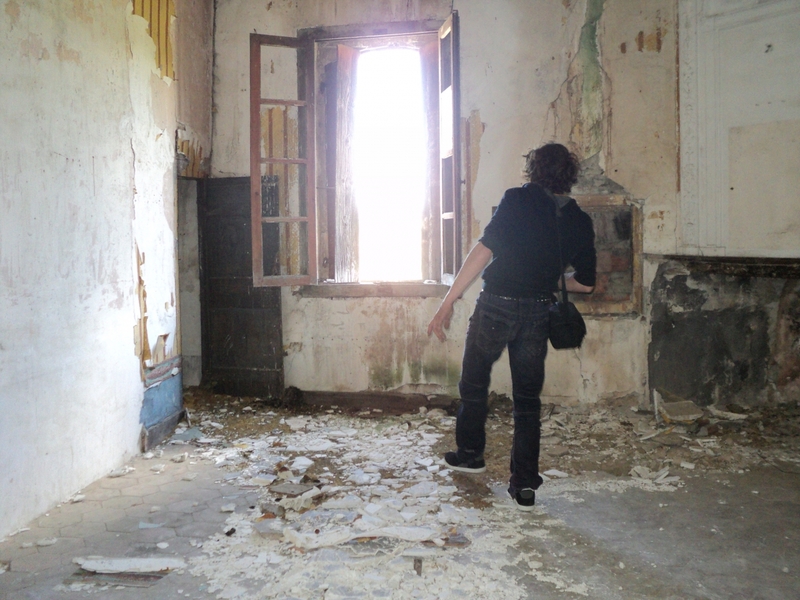 My friend Mickael Montepin, a French historian, and myself, decided to investigate. 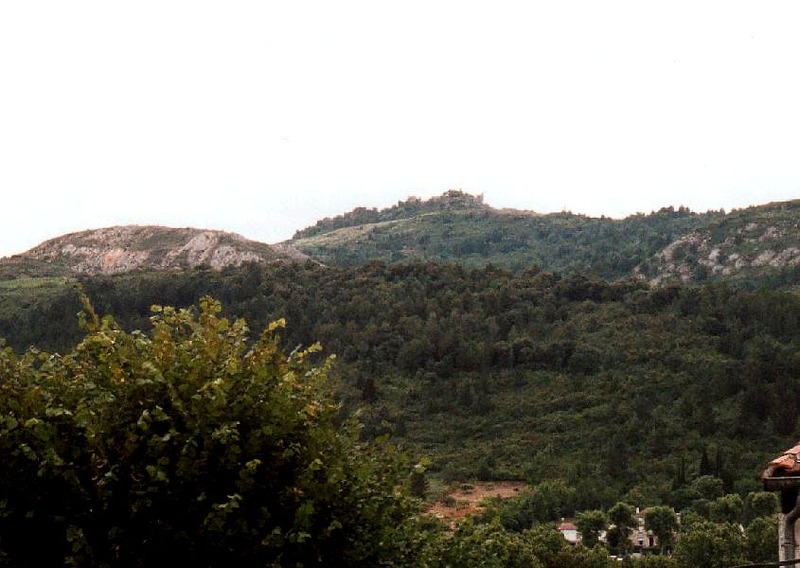 Montazels, with the castle on the left and the church on the right. At the back of the chateau (I could image the carriages of the aristocracy driving up, leaving their passengers in front of the chateau and then driving around the back) we found the stables. There is no doubt these arches are Medieval, at the latest, 15th century. 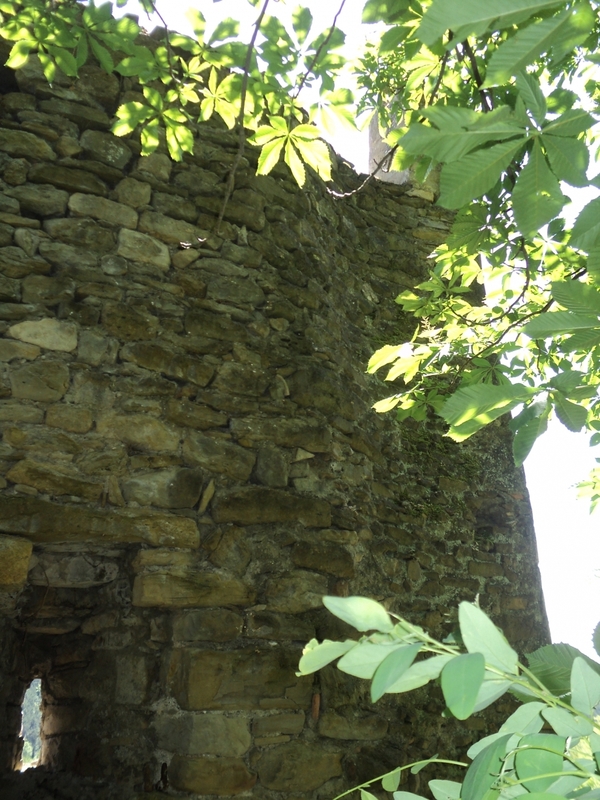 We found an entrance going into the servant's quarters, to the north-facing back of the château. This kitchen is where all the meals for the household would have been prepared. 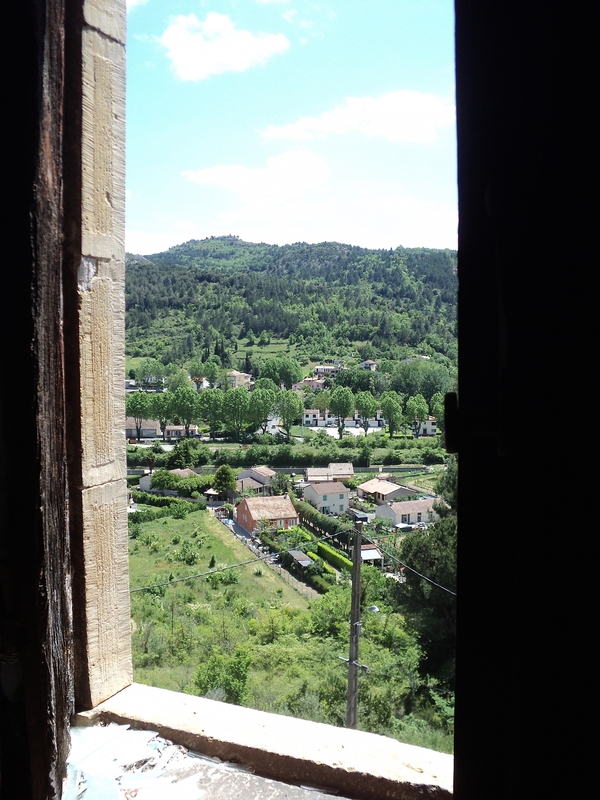 To the right of it were the aristocratic family and/or reception rooms, a little higher and facing south-east, overlooking the Aude river valley with a view of Rennes-le-Château. 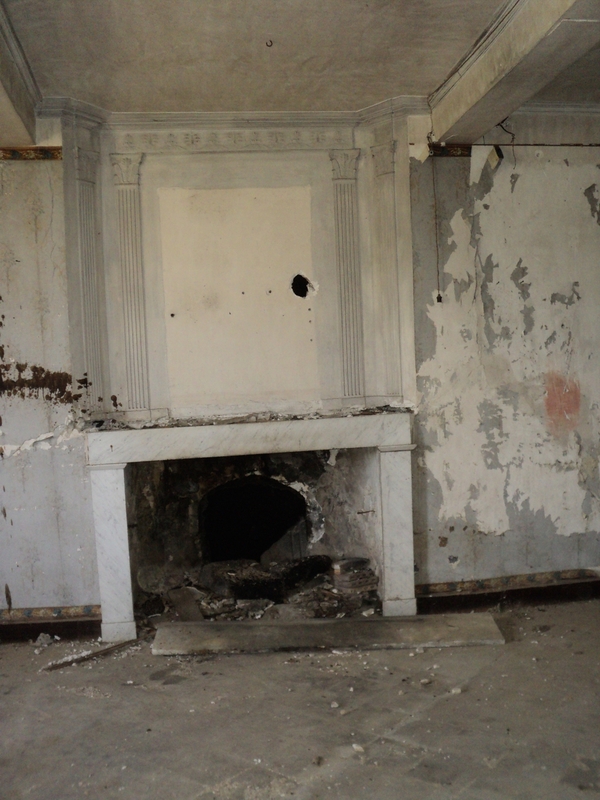 From the style of several marble chimneys in these rooms, I would have said the last renovation to the property was done about 1905 - in the time of Bérenger Saunière in fact. As regards the view, in the pre-Revolutionary hey-day of course, there would have been very few building, roads, factories and so on, to be seen in the valley of Couiza below. 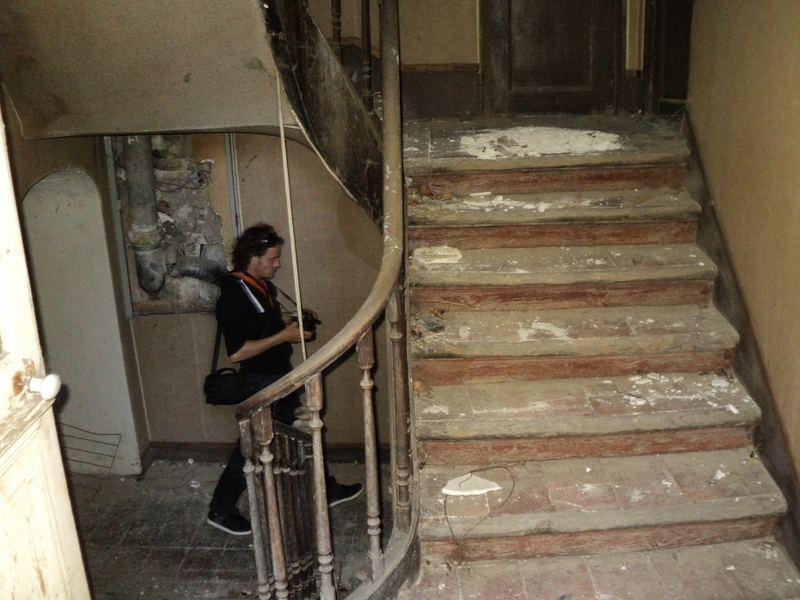 Above these rooms were the aristocratic bedrooms and here the decay was very bad. 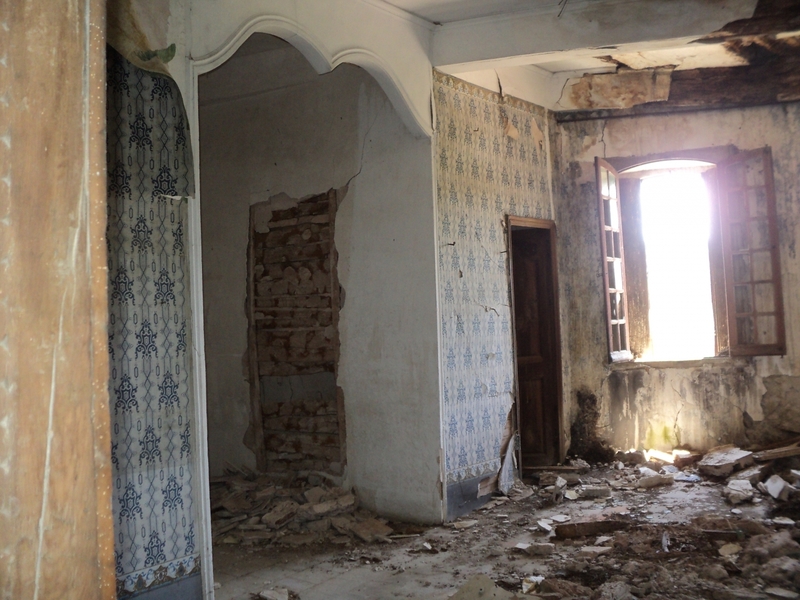 It was more than just broken floor-tiles and rubbish left by "hippies" camping there, but ceilings on the verge of collapse. This must have been such an elegant room . . . Here's another beam (below) on the point of collapse, just from damp and decay. 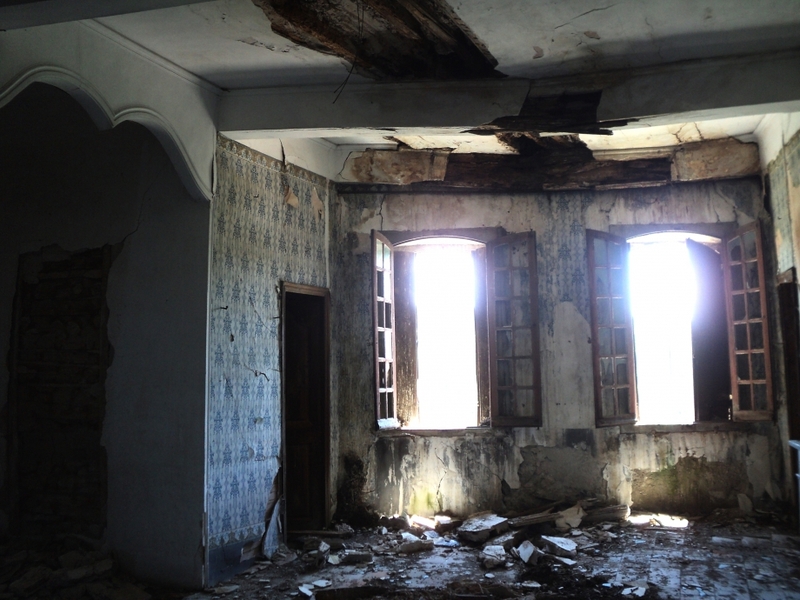 Once a main-beam like this gives way, the whole building drops inwards, then the roof drops and restoration becomes impossible. 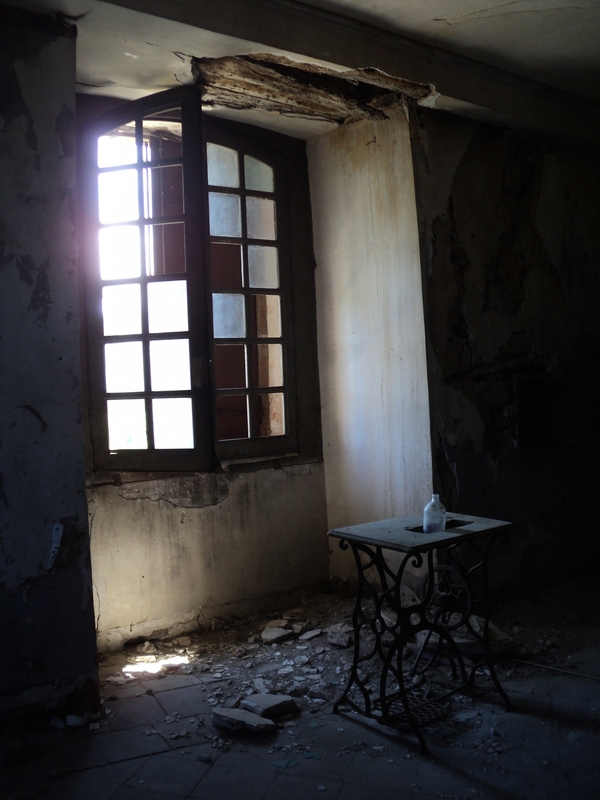 I was nearly in tears by this time, as though the house had a soul, and it was so lovely. 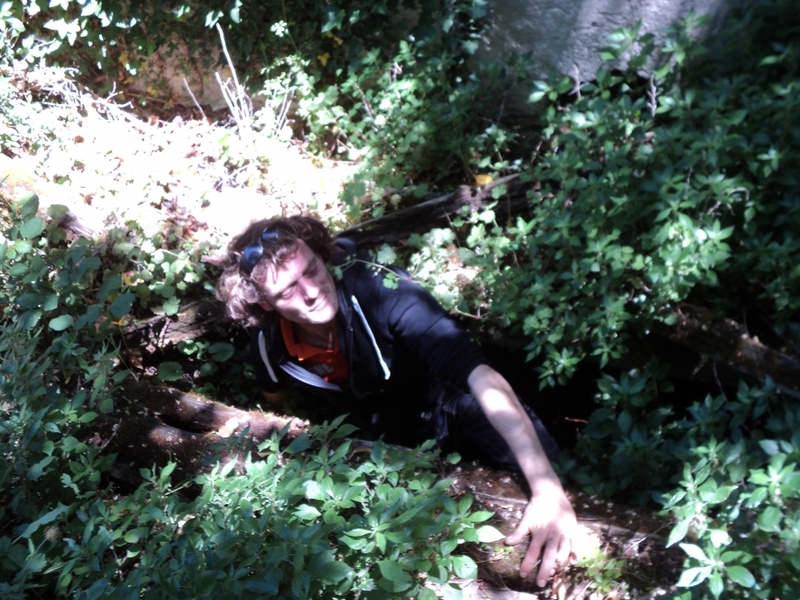 We continued our explorations. 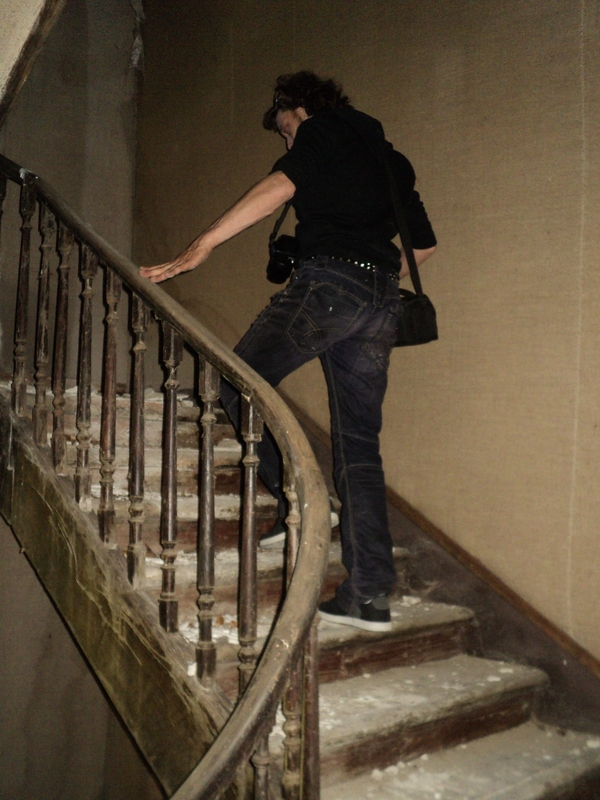 There was a third floor, presumably with servants' bedrooms. I never went up (the danger was getting to me) but Mickael did, and came down with an old book, the date of publication being 1947. So we know the château was still lived in then. 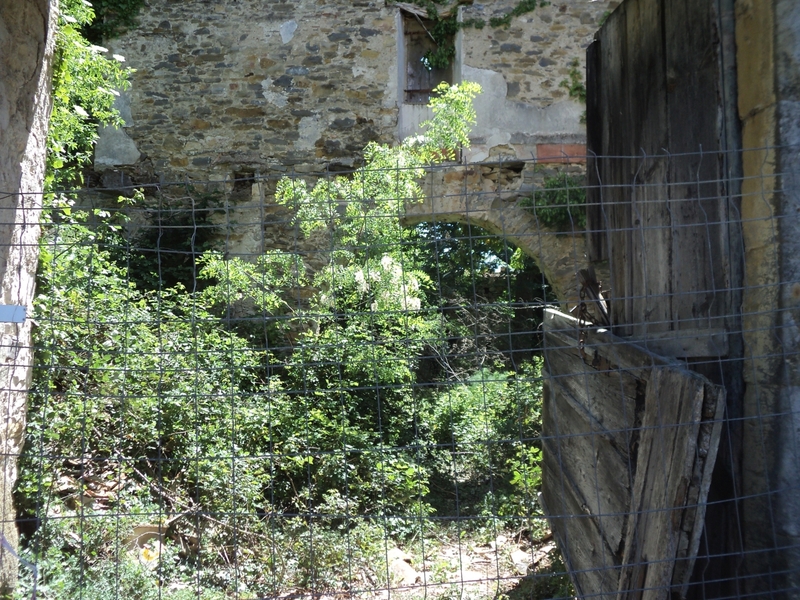 Outside, near the stable yard, Mickeal identified an old chapel - and found the crypt underneath it. He emerged from it saying that it needed professional exploration and he would return with his historical society. The chapel and its crypt are obviously medieval and there must surely be a story there, about how it came to be abandoned, and the families of the 19th and early 20th century no longer used it. The great families of pre-Revolutionary times used to have private chapels attached to their castles, and the aristocracy was buried in the crypts under them. 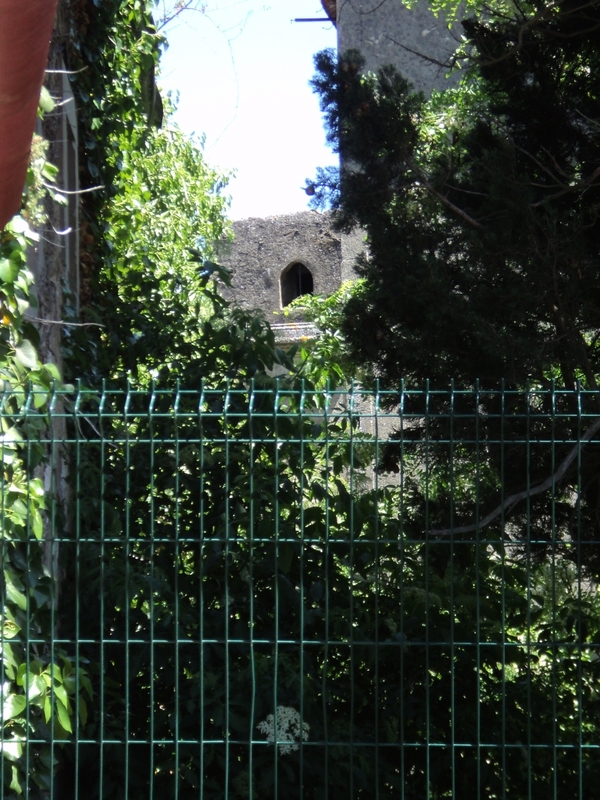 We know that the castle was owned by the Cazemajou family for there is a family tomb in the graveyard dated 1834, and when Bérenger Saunière was a boy, (born in 1852) his father worked for the Marquis de Cazemajou. Around the castle were three terraces where one could imagine the aristocracy taking their ease on summer evenings . . . But the terrasses were not very old, I would have dated them early 20th century, one can imagine the ladies in their long clingy dresses drinking cocktails there and listening to jazz . . . but since then there has been two world wars. 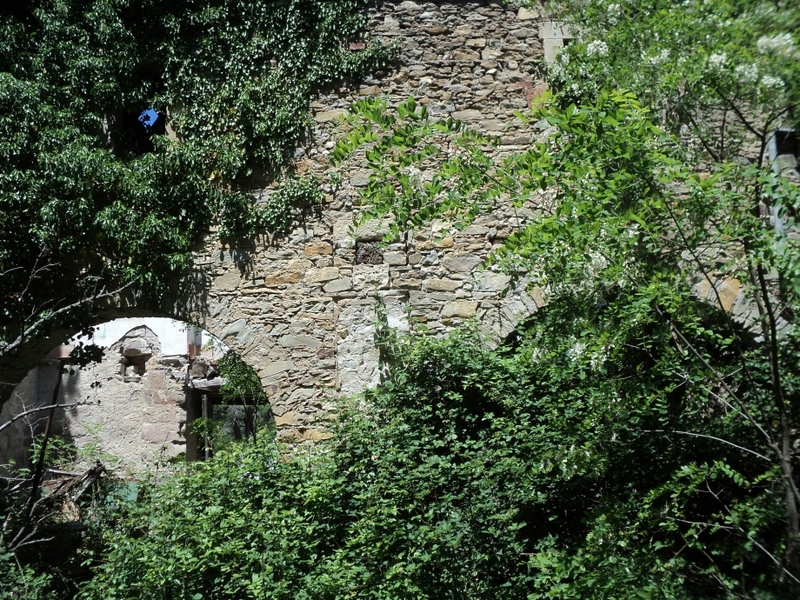 A municipal park has been built to the north side of the château and from there you can still see the window of the old medieval chapel in the grounds. 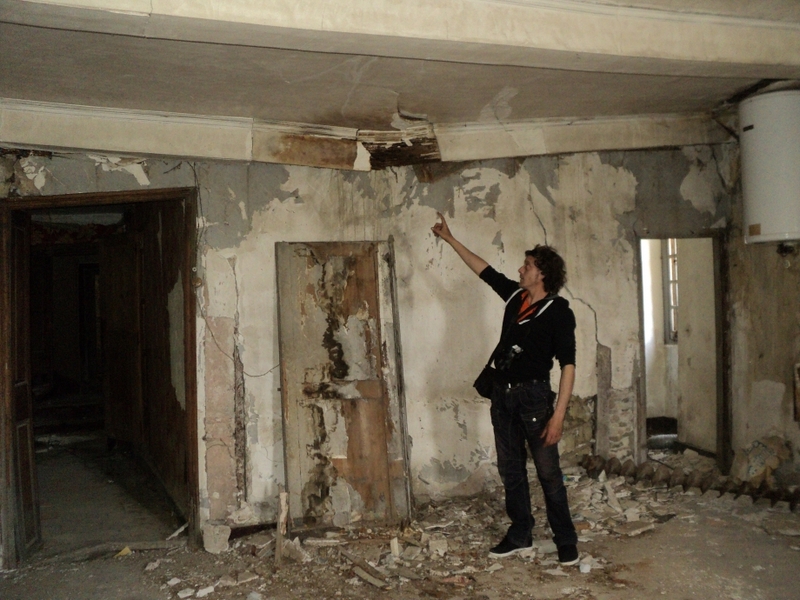 For more about my historian friend Mickael, click here. Montazel features in my book, White Ladies in Cathar Country, about the ancient pagan goddesses to be experienced in our region. Click here to see more. You can also read more about the family who still lived there in the time of Saunière, the Cazamajou's, in this book here.